We have a few original tapes available. They've been checked out and play well. You can order a tape from our For Sale page. More information on demo tapes is available at the Auto 8-Track Shack. The site has lists of tapes from Ford and other manufacturers as well as a for sale page where you might just find that classic John Deere tape you had when you were a kid. Introduced in 1966, the "Stereosonic Tape System" brought high fidelity out of your living room and into your Ford, Lincoln, or Mercury for the first time. Available for the entire Ford line, the system consisted of an AM radio with integral stereo "8-Track" tape player. 8-track tapes contain a continuous loop of tape with four programs of music. Each program uses two tracks with one track for the left channel and one for the right. 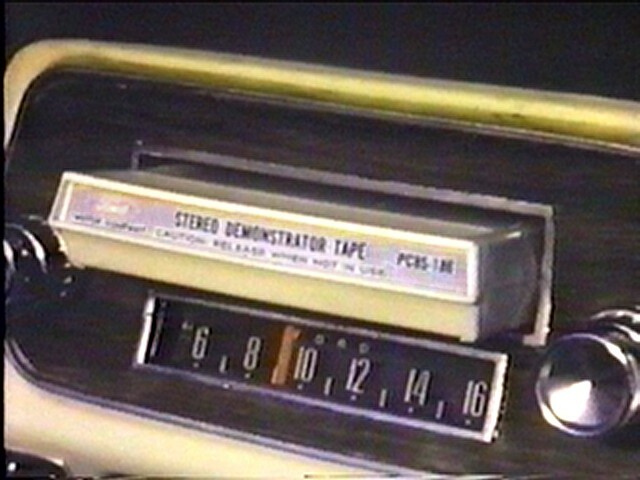 Since the tapes to play on the new systems were fairly new and not readily available other than at your finer truck stops, Ford provided Sampler tapes. These tapes were put out by the RCA Victor Special Products Division and contained a variety of music and instrumentals. As shown here, the tapes came in a plastic case and included a warranty/instruction manual and a card with information on how to obtain tapes containing musical selections other than the fine collection of American Dental Association approved tracks provided by Ford. One of the more interesting features of these tapes is the artwork on the packaging. The artwork on the first few years was somewhat utilitarian and limited to the box only. 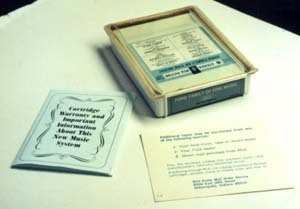 The tapes contained a label showing the music selection for each program. 1966 and '67 tapes came in these plastic boxes. Sometime in 1967, the plastic box was scrapped for the more economical cardboard sleeve. The '67 PC8S 500 tape came in both the earlier plastic boxes and in the cardboard style as seen here. The artwork stayed the same; however, the musical selection was now included on the sleeve as well as the tape. The 1969 tape is interesting in that the design looks so much more modern than the '68 even though the basic components of the design were the same. This design looks as if it were done by the same folks responsible for service replacement part boxes. In 1970, someone in the design studio must have finally noticed one of these tapes laying around and being artistic types, decided they were a canvas for creativity that was going to waste. So they began an eclectic series of artistic styles that spanned several years. 1970 also marked the first year that warranty information was moved to the side of the sleeve rather than as a separate card. The warranty period was also reduced to 30 days from date of purchase from the one year period of earlier tapes. Although drugs, assassinations, and wars were raging in the late '60s and early '70s, all was peaceful in the design studios at Ford as the serenic scenes of the 1970 and this 1971 tape show. The focus moved from the seashore to the great Southwest in 1972. Cover art switched from photography to what appears to be oil on canvas. Now there would be an interesting piece of Ford history to find. This impressionistic scene used for the 1973 tape is one of my favorites. For 1974, the artists in the design studio went for the over the sofa look with this scene reminiscent of paintings seen in living rooms all accross America at the time. 1975 marked the first appearance of Ford World Headquarters on a sleeve and the last uniquely designed slipcover for the stereo tapes. Ford HQ remained the focus of tape art up through 1980. 1975 was also the last year for the phrase Family of Fine Music. 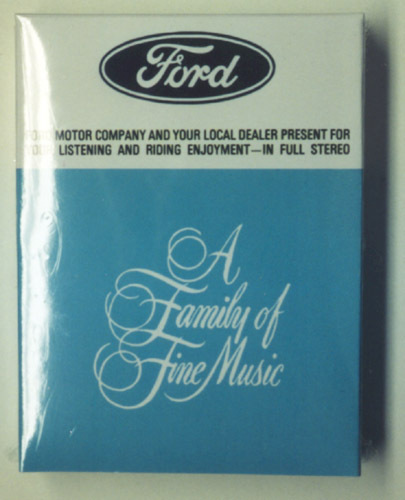 In 1976, Ford switched to these open window generic sleeves used for all tapes put out by RCA. The tape itself contained a label with artwork that showed through the window of the sleeve. This scene shows Ford HQ in the fall. This nighttime Fall view of Ford HQ in this 1977 tape is interesting in that it is symbolic of the dark times that befell Ford in the late '70s. In 1978, Ford was in the midst of its darkest times with cars that were too large, poorly built, and most importantly, not selling. These times were reflected in this winter time view of Ford HQ. Apparently, 8-track tape artwork design was the least of Ford's worries in the late '70s as this same design was used up through 1980. One interesting note is that the warranty period was increased starting in 1978. The warranty period was not for a specific time period but rather, ended in December of each year. Starting in 1981, Ford switched to this design, bringing back the Better Idea theme used in happier times. The spirit of Henry Ford was still alive in the early '80s; at least in the audio department at Ford. Ford continued to offer 8-track stereos up through 1983, all using this same design; long after cassettes had become the predominate tape media. In 1979, Ford dropped the unique sleeves for this generic RCA Q8 sleeve. 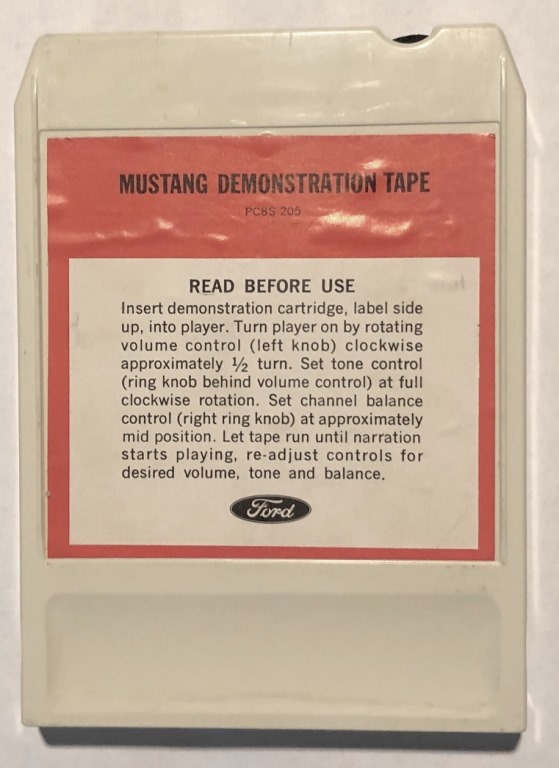 This image shows the label on the tape itself which contains written instructions for using the tape player. Variations in this label were used for all the quad tapes. All Ford quad tapes are red in color rather than the white used for the stereo tapes. Starting in 1972, the numbers were stamped directly into the plastic of the tape. This practice continued through 1976 (except for quad tapes which have no markings) after which, markings were limited to the tape label only. The tables below list the identifying numbers used for both the stereo and quad tapes. These lists may not be complete as there was more than one tape produced in some years. 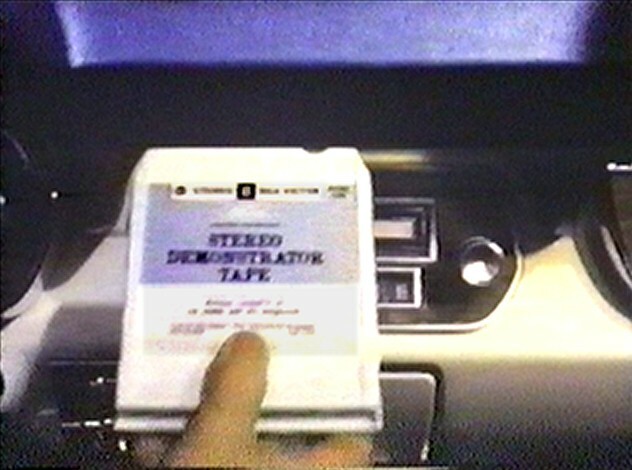 1) This 4 minute tape was titled "Stereo Demonstrator Tape" and was probably only intended as a Salesman's demo tape and not normally given away. Click here and here for images of these tapes. 2) This tape is titled "MUSTANG DEMONSTRATION TAPE"
3) This tape is titled "THUNDERBIRD DEMONSTRATION TAPE"